On the quest for the Holy Rail. His signature move is the Christ Air. Let those without skills cast the first heel flip. Jesus was very popular at the skateboard park for his ability to heal with a touch. Now watch me resurrect these fresh lines. He later ends up on an episode of scarred. You can say 'jesus f*cking christ' because his name wasn't 'Jesus F*cking Christ,' so you're not 'taking the lord's name in vain' by saying it. Besides, that's not what that commandment meant anyway, it meant DONT USE ME TO SCAM MONEY FROM PEOPLE! 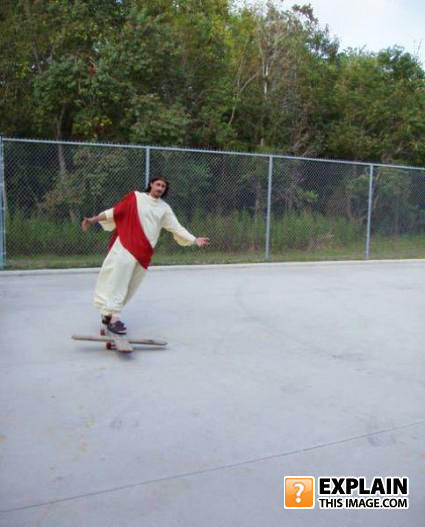 @Jesus was very popular at the skateboard park for his ability to heal with a touch.............. This is where we get the Red Cross from. your so homosexual you go to a gay bar every couple of weeks so you get the social acceptance you need.